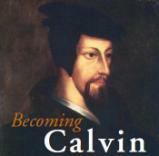 In 2009, a series of successful staged readings of Becoming Calvin was held in the Maryland and Virginia suburbs of Washington, D.C. In the summer of 2008 The Reformed Institute of Metropolitan Washington commissioned playwright Ann Timmons to write a play for their part of a worldwide celebration of the 500th anniversary of the birth of John Calvin. Thanks to the hard work of actors and production crew members, the readings were overwhelmingly successful. Audience members and cast members alike asked what the next steps would be. Three years of hard work followed: creative work (script revisions, readings, more script revisions); and production work (fundraising, budgeting, grant-writing). In the spring of 2012 Team Calvin was ready! Months of auditions, design consultations, and rehearsals followed. The world premiere production of Becoming Calvin took place in Fellowship Hall Theatre of Capitol Hill Presbyterian Church, September 13 – 23, 2012. The talented cast and creative team was drawn from Washington’s best professional theatres. Ann Timmons directed the production.